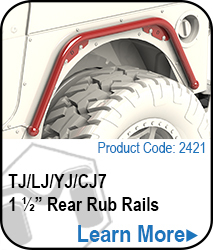 The MetalCloak CJ-5 Corner Guards provides Rock-Biting protection for your Jeep's rear quarter panel. 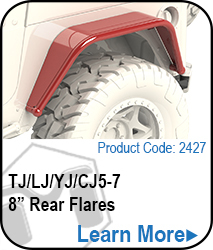 Designed specifically as a mounting system for our Rub Rail, 4"or 6" Quick Release rear flares, the flare mounting hardware is built right in. 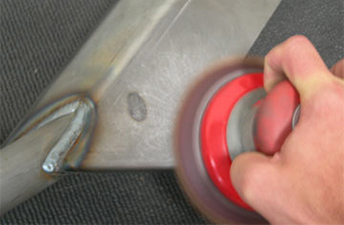 Rock-Biting Corner Guards, designed to mount the Quick Release Flares. 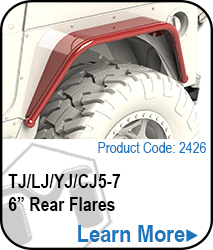 7GA Hot Rolled Steel Plate creates a bullet-proof second skin for your Jeep. Ready to receive the Quick Release flares available in Rub Rail, 4" or 6". Just enough tire clearance, allowing for 33s on a stock CJ-5 or 35's on a 2" BL! Simply cutting a little from behind and in front of your tire maximizes clearance - allowing for 35s w/ a 2" BL! The Corner Gaurds alone give you more clearance than stock. 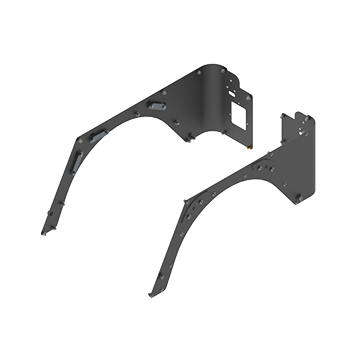 Corner Guards integrate with our Rocker Rail creating one solid unit of protection. fit easily on a stock Jeep.